the object perpendicular to its axis and viewing it end on. In other words, a cross section of a solid is a plane figure obtained by the intersection of that solid with a plane. depending on the orientation of the slicing plane. three edges emanating from any one vertex. 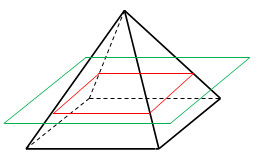 A prism has the same cross section all along its length. A triangular prism has a triangle cross section all along its length. What cross section can you get from this figure when you cut parallel to the base? Use the figure below to answer Questions 1 – 2. A piece of cheese is a prism with equilateral triangular bases. How can you slice the cheese to make an equilateral triangle? A cross section is the face that results from slicing through a solid shape. True or False? You can get an ellipse from a cross section of a sphere. True or False? Describe the cross section below. The cross section is a pentagon. The cross section is a pentagonal pyramid. The cross section is a circle. The cross section is a small sphere. The cross section is a point.